PRESS RELEASE: IDW Publishing and Universal Studios Consumer Products have joined forces to bring the hit zombie comedy "Shaun of the Dead" to comic fans, in the form of a miniseries chock-full of exciting extras. The adaptation, written by IDW Editor-in-Chief Chris Ryall with input by director Edgar Wright and co-writer/title actor Simon Pegg, delivers the storyline of the highly successful movie, and more! The comic version of the film will incorporate deleted and unshot material, too. Depicting all the action will be artist Zach Howard (Detective Comics), aided by Thompson Knox's vibrant colors. Each issue will also boast a painted cover by British artist Jason Brashill. "Writing the adaptation of this movie is really a perk of the job I never quite expected," said IDW's Editor-in-Chief Chris Ryall. "And even better is the the fact that the artwork for this adaptation is so phenomenal, and that Edgar and Simon have been so approving and helpful. I think the love all of us have for this project shows on every page, and I hope fans of the movie feel the same way." 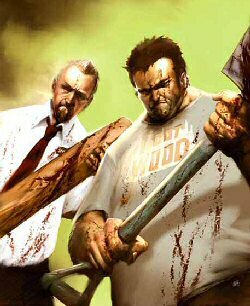 "Shaun of the Dead" is a four-issue, 32-page, full-color miniseries debuting in June.